My Dad (aka Fred) celebrated his 70th B-day and all of my siblings and I made it home for the occasion. Unprimped, Unplanned, and Unprofessional... these will probably be pics that will be most treasured for years to come. I can't remember another time that just the kids got together since we all got married off. Mark and Rena were gone when I was just a little girl. There is a 12 year span between Mark and I and 16 years between Shawna and Mark. We are also all so spread out across the country that it makes it extra rare to get together. 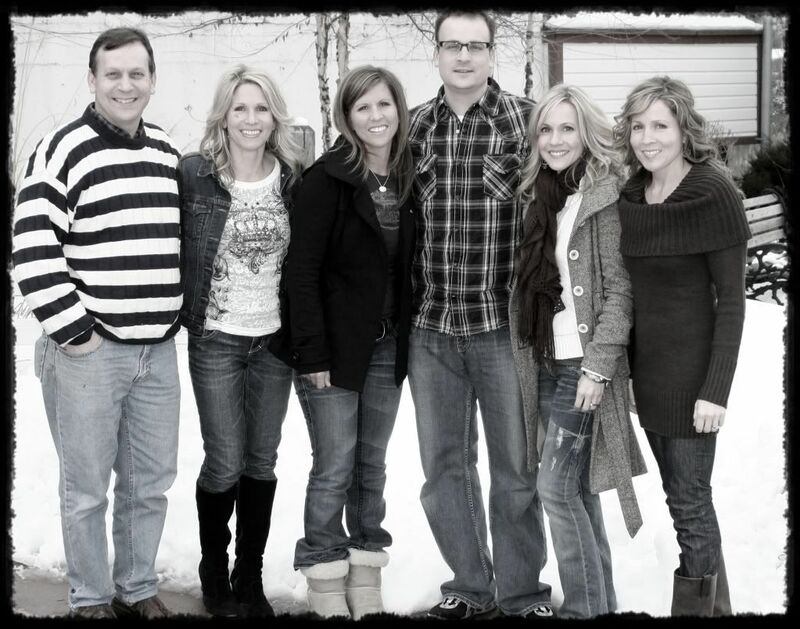 We all came without our kids, except Tonya who lives near Mom and Dad. Her kids got some extra aunt and uncle play time. Tonya's husband, Dave, took the pics for us. We owe him a huge thank-you. He did great. We had a few minutes before our reservation at Joe's Crab Shack, so we found a spot outside- definitely not the ideal backdrop, but it worked. Without mentioning names- I just wanted to say that there are some who never think taking photos is a good idea.... You know who you are and one day you will thank me for being the photo nazi. 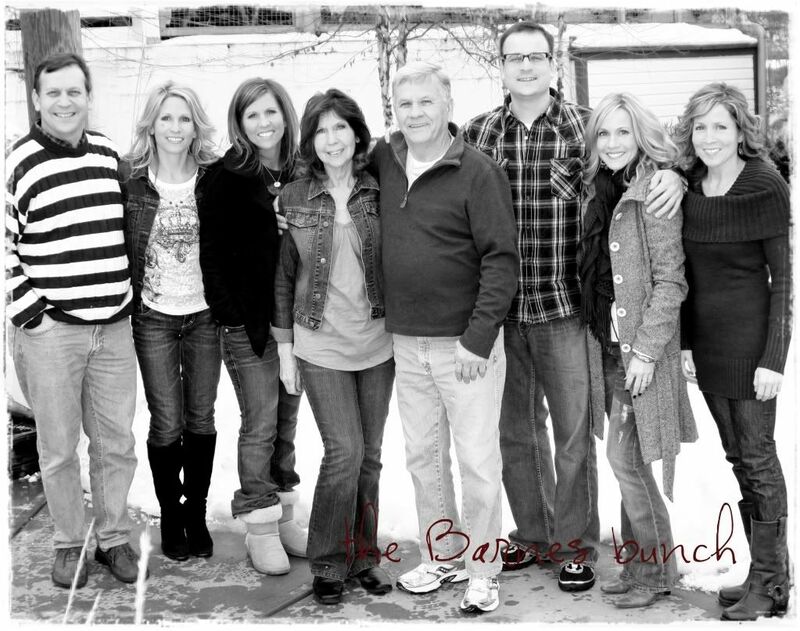 From left to right: Mark (6 kids, 1 grandkid), Rena (4 kids, 2 grandkids), Shawna (5 kids), Nate (3 kids), me (2 kids), and Tonya (4 kids). 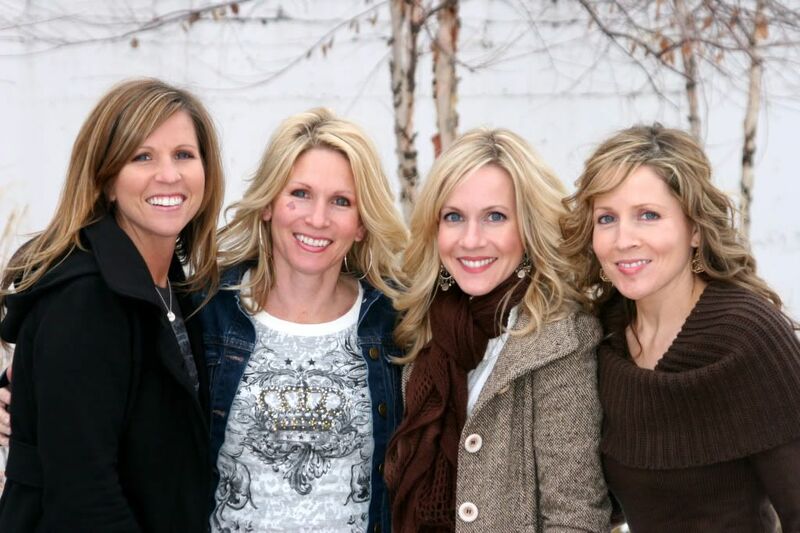 The last time we got a photo of the 4 of us girls together I was 8 months pregnant with Pokey, who is now 8 1/2, and exceptionally swollen- such a long time ago. 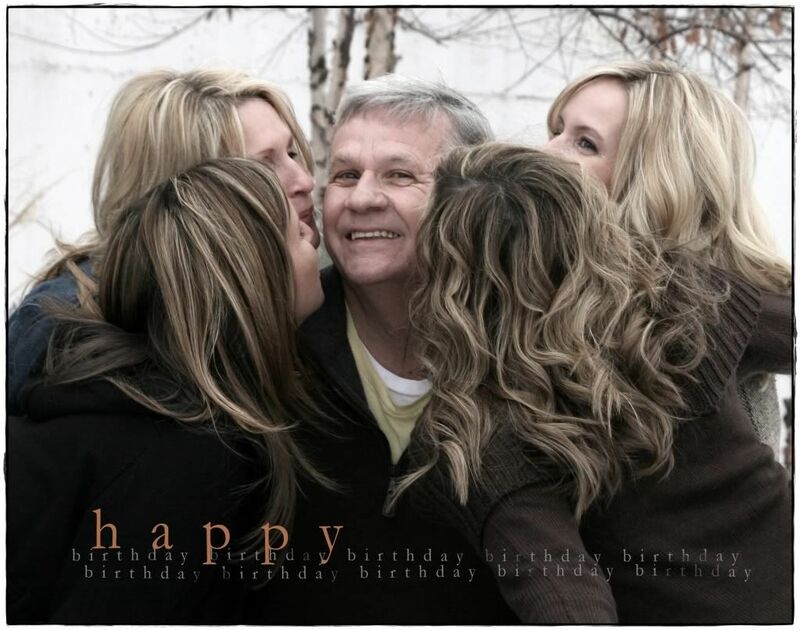 Dave thought it'd be great to have the girls kiss their Dad for the last pic. What better gift could a guy want than that? Being the tall person I am, I ended up in the back near his ear. There was no way I was kissing that thing. You can't see my mouth, but if you could you'd see that I'm dying laughing. I think one eye might even be closed. Good times. Nothing like it. When we get together there is always all sorts of drama and tons of laughter. It would appear that we at least share a similar sense of humor and Barnes laughter is extremely contagious. To my family: If you like any of the photos here let me know, otherwise I will put together a compilation of ones I like and send them via email or cd. These were just some of my favorites. Sorry boys, your pics didn't turn out. 1. Enough snow in KY for building snowmen and going sledding- and sweating at 50 degrees. 2. My 9 yr old nephew giving me snowboarding lessons. 3. Eating lots of good grub! 4. Crab Shack attempting to embarrass Dad with a stick horse and a cowboy hat- a lost cause. 5. Watching Shawna eat crab. 9. Mom sick, but still trying to keep up (and making lots of trips to and from airports). 10. Driving through the midwest without children- both ways. 11. Rena giving me an apple during "The Lightning Thief". 12. Bunking in the basement with my sister. 13. Tonya painting my toenails with cheetah print. 14. All 3 sisters giving tutorials on curling hair. 15. Dad getting his 52 inch tv. I made it home from my killer drive Monday night at 5:45PM and was required to be in "Mom mode" the second I walked in the door. Little Man refused to give me a hug- he was too engrossed in his book, so he said. Haldan had just left for work (night shifts) and Pokey had ice skating at 6PM. So back in the car we went to head to the ice rink. I got home and hadn't even unpacked the car when I realized the children needed dinner. I grabbed a frozen pizza from the freezer and Little Man yelled, "Dinner better be good because you've been gone for 2 weeks." He knew that wasn't true and he was not trying to be funny. He was being a 10 1/2 year old brat. Welcome home me. I gave him the frozen pizza with a smile. I win. Perhaps I should have had him make the dinner instead. Maybe next time. I must admit this may be the first time I was away that I didn't miss my children. I can't decide if I am a terrible mother or just in desperate need of a break. I was happy to see them both when I got home, even the one who refused to hug me. Ah, the sweet joys of motherhood. Back to the grind I go. look like loads of fun, i could only imagine how wonderful that was with no kiddos.....AAAHHHH....complete freedom, finishing sentences, or thought for that matter, getting your whole drink or plate of food to yourself, time to reflect on your roadtrip instead of backhanding someone every hour!! trust me, and all mothers will agree....you are not a bad mom!! i love slamming the door daily when my kids leave for school, and i love seeing them come home too though! 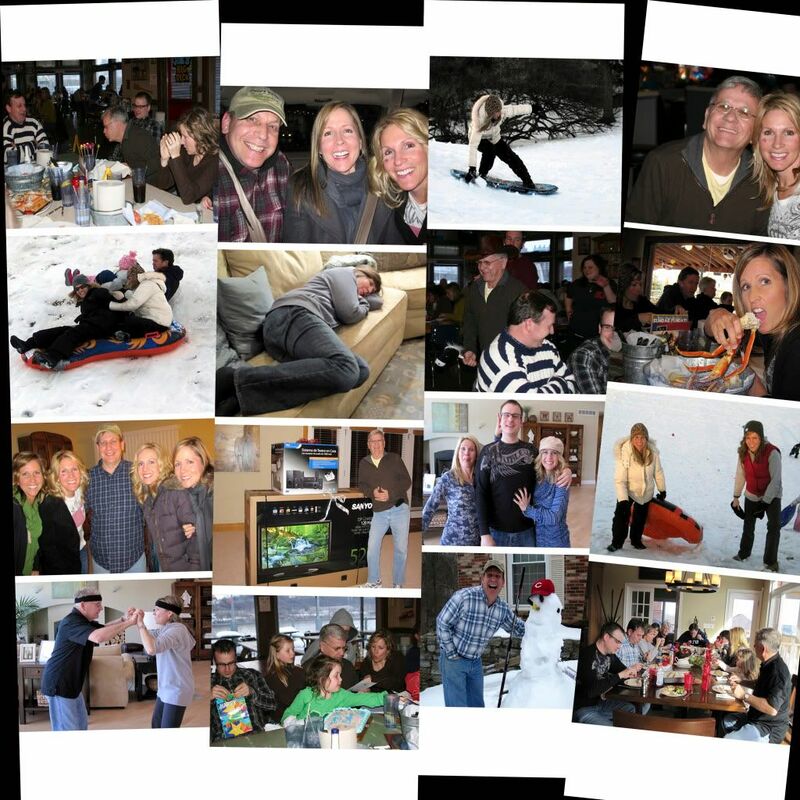 you deserve that break and fun with your family, and guilt free fun at that!! buy the way, super good pix!! what a gorgeous family your dad has...i'm sure he is so proud! I'm glad you guys all got a break! It looks like a blast. 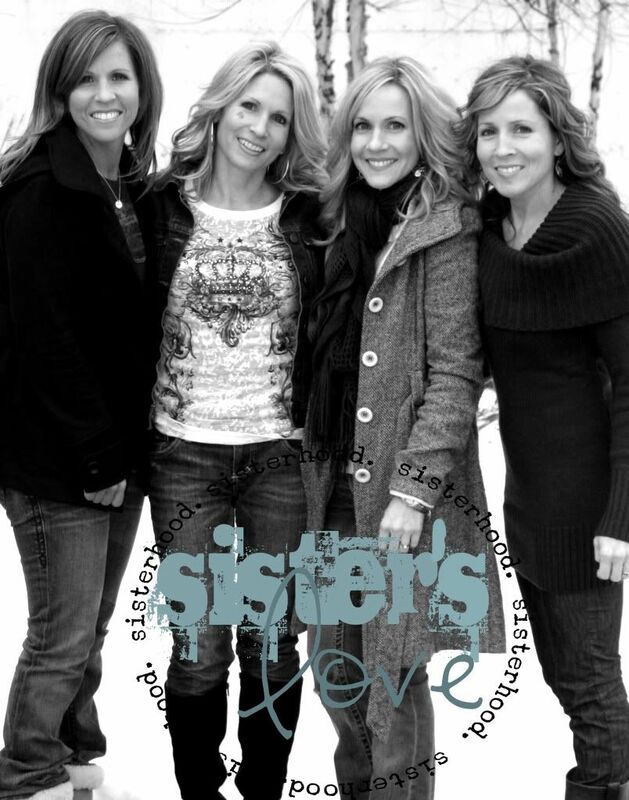 I love the sisters picture. So weird how far you've all come (at least that's my thought when I see all my sisters). I thought you only had one sister!!! Your family is all beautiful! What a fun trip!!! It looks like you guys had a ton of fun! :) Good pics too! Sorry about the "so-boy" comments. Hope things have calmed down since then!